For RiotACT columnist and former Greens candidate for Kurrajong Rebecca Vassarotti, Christmas is all about celebrating with the important people in her life and watching one of those traditional festive season favourites, the Star Wars movies! What I love most about Christmas is spending time with friends and family. I love that this is a time of the year when people prioritise getting together and celebrating relationships and friendships. I love the focus on giving, creating a space to think about the people that are important in your life and getting the chance to tell them how special they are. What I like least about Christmas is that we can get forget what it is all about as we get so busy preparing for the day – running around getting presents, food, but forgetting why we are doing all this. I get very uncomfortable about the consumerism but also love the look on my kids faces when they receive a gift that they don’t expect. My best Christmas ever was in 2006. My twin boys were four months old and I was in ‘mumma heaven’ – we had survived the first three months! My five siblings, parents and extended family descended to the coast and we had a rolling celebration that lasted a week. Its not that different to most Christmas’ these day – it’s just getting bigger as new nephews, nieces, in-laws and a beautiful daughter have joined the family. My favourite Christmas songs are Last Christmas by WHAM! and Wine in the Sun by Tim Mitcham. The first because I grew up in the 80s and its WHAM! The second because it is a sentimental counterpoint to all the songs about a white Christmas – and it makes me cry every time I hear it. My favourite Christmas movie is… Empire Strikes Back. I know its not really a Christmas themed movie, but for me it is connected to Christmas. For about 20 years my two brothers have been watching together every Christmas night. Now they sit down with my kids every year, and they all recite it word for word. Now we have a Star Wars movie arrive just before Christmas every year, Star Wars movies are definitely Christmassy! I celebrate Christmas Eve by getting ready for whole family to come over for Christmas lunch. We turn on the Christmas lights on the tree and play Christmas carols, and the kids speculate about what is under the tree. We put out the carrots and grass for the reindeers, and the whisky and shortbread for Santa and try to get everyone in bed at a decent hour. I celebrate Christmas Day by eating basically. Santa’s presents are discovered in the early morning, but wrapped presents have to wait until the first shift of visitors arrive and after we have gone to a Christmas service with my Dad. We then embark on a long leisurely lunch cooked by my amazing partner. You already know what I do on Christmas night. I celebrate Boxing Day by getting ready to go to the coast. We love the beach and having some time down the beautiful south coast of NSW is something that must happen every summer holidays. There are so many beautiful secret spots that we all explore and call our own. The gift I would like most is a good book recommendation. I love fiction, and summer is the time where there is actually some time to do it. My favourite read this year was A Little Life by Hanya Yanagihara. I have a pretty good start of a list of holiday reading but always open to more! For Christmas this year I’d like to know that the children held on Nauru because of our Government have some hope in their lives and their mental health is improving. I would like to know that they know that they may not be held in detention for too much longer and that they might be able to look forward to a normal childhood next year. Would you like to join the RiotACT team in sharing your thoughts on Christmas with RiotACT readers? We’d love to read them. Please log on to the RiotACT website and choose “create article” to submit your own responses to the My Christmas cues for publication. 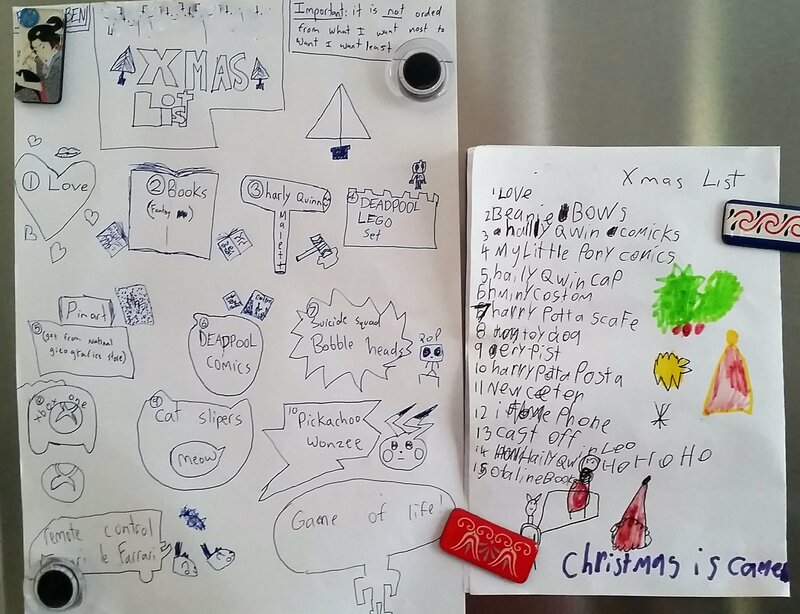 Pictured above, The Christmas lists from two of Rebecca’s children. “They are smooth … always put love at the top before a long list of other gifts,” Rebecca writes. Also the family’s Christmas tree.